With this post, I’m reporting updated results on the ideological ideal points of New Hampshire legislators, introduced previously here. In that analysis, I found that libertarians in the New Hampshire House in 2014 tended to vote with the right (and vice versa) on most roll-call votes scored by the New Hampshire Liberty Alliance. That included votes on bills to prevent localities from acquiring military vehicles for police, to reform civil asset forfeiture, to protect public school students’ privacy, and other civil-liberty issues where you would have expected the left to be more libertarian. 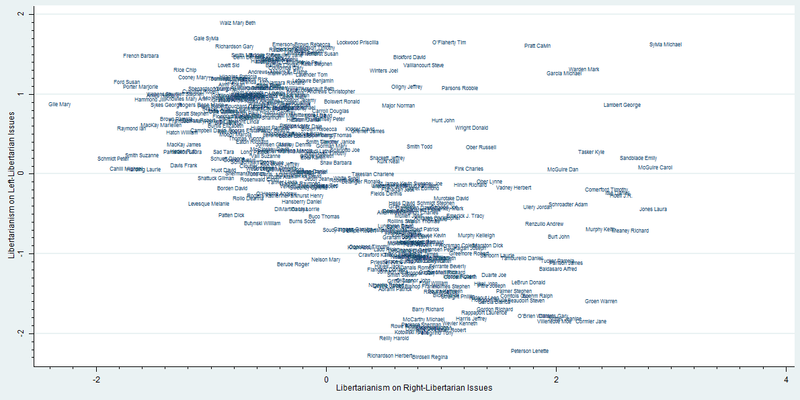 In fact, the more left-wing you were, the more likely you were to oppose the libertarian position on those bills. However, there were a few bills on which the left was more libertarian, mostly dealing with marijuana and other criminal-justice issues. When those were separated out, the analysis revealed a distinct cluster of 10-40 legislators (depending on the strictness of the criteria for inclusion) who tended to vote with the left or center on this just-mentioned subset of social issues but with the center or right, respectively, on the majority of roll-calls: a libertarian(-ish) caucus. I am now updating the analysis with 2013 roll-calls included, to cover the entire biennial session. I’m also reporting more charts and tables for the geekily inclined. To recap, I ran a Bayesian IRT analysis with imputation of missing data (abstentions and absences) using R package “pscl.” First, I began with the hypothesis that libertarianism-communitarianism was the first dimension underlying all roll-call votes. This hypothesis seemed to work for most roll-call votes, but it failed on some. In fact, a left-right dimension underlies most legislators’ voting decisions. So I separated out the bills on which the hypothesis failed and ran separate analyses on both sets. That resulted in two dimensions of ideology: how right-wing you are on right-libertarian issues (henceforth, “right-libertarianism”) and how left-wing you are on left-libertarian issues (henceforth, “left-libertarianism”). I also corrected some errors in the NHLA data (votes coded the wrong way and one individual legislator vote miscoded) and made some different judgment calls from them. I mentioned some differences I had with their inclusion of votes against casino bills as pro-liberty and votes against a domestic violence bill as pro-liberty. I would have dropped them from the analysis if they had made any difference to the results, but they didn’t, so I didn’t bother. However, I did make some more substantial judgments. I dropped two voter ID/registration bills that the NHLA supported (loosening voting requirements). These were party-line votes: libertarian Democrats voted with their party in favor, and libertarian Republicans with their party against. NH’s voter registration rules are extremely lax, and the reform proposals so modest, that I could hardly count these bills, which undid some changes of the 2011-12 legislature, as clearly pro- or anti-liberty. Had I included them, they would have dominated the second dimension, reducing the additional information it supplies beyond mere left-right ideology. Finally, I counted votes in favor of a bill banning prison privatization as anti-liberty and votes against expanding the research and development tax credit as pro-liberty, directly contradicting the NHLA’s positions (but with good reason, I think – the data showed stronger fiscal conservatives voting against the NHLA on both). There were 404 legislators that served at some point during the 2013-14 session (the maximum at any one time is 400). There were 149 total bills I looked at, but in the end 136 made it into the right-libertarianism analysis and 11 made it into the left-libertarianism analysis. Another small difference from the last effort is that this time I ran a NOMINATE analysis first to get priors on each dimension for each legislator. 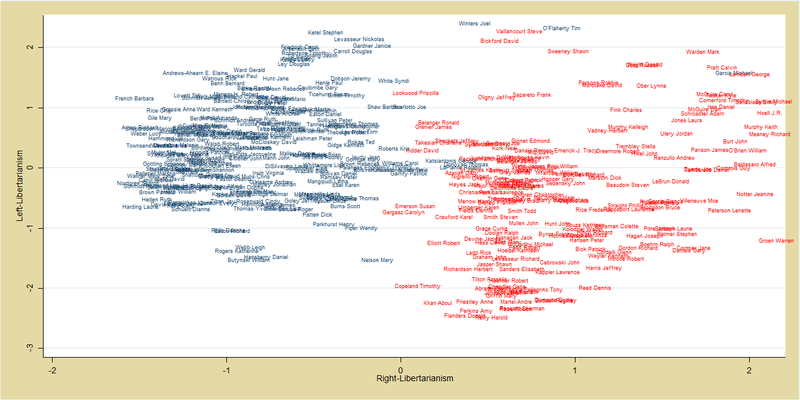 The NOMINATE analysis also suggests 2 dimensions of ideology, just rotated slightly differently. All of these were losses for liberty, and given the Democratic control of the House then, that’s not surprising. But only two of them passed both houses and were enacted into law: SB 413, Medicaid expansion, and SB 120, increasing campaign finance reporting and registration requirements. The top bill, HB 544, would have created a state-based Obamacare exchange. HB573, medical marijuana legalization, dominates this list. The next on the list, HB492, was marijuana legalization. All of these were victories except Death with Dignity, HB 1325, again predictable given Democratic control of the House. Only medical marijuana and HB1624, modernizing the juvenile justice system, were passed and enacted into law. Of course, some of the victories consisted in defeating bad bills. William O’Brien was the 2011-12 Speaker of the House. Several of these legislators are Free State Project movers. Joel Winters was the first FSP mover elected to the state house (2006). Steve Vaillancourt is a left-libertarian gadfly and served in the legislature for close to two decades, before losing this year. Note that a handful of communitarians do now reveal themselves: William Butynski, Daniel Hansberry, Katherine Rogers, Leigh Webb, Deanna Rollo, Richard Eaton, Mary Nelson (all Dems). Ross Tilchin writes up the results of a Brookings study on libertarians in the Republican Party, citing some of the research I have done here on Pileus. The main point Tilchin argues is that libertarians are at a severe disadvantage nationally within the Republican Party, relative to competing constituencies like moderates and the religious right. However, see also David Kirby’s rejoinder at Cato@Liberty. He argues that the Brookings study seriously underestimates the proportion of libertarians in the general population and in the Republican Party. The debate seems to turn on how strictly one wants to operationalize the concept “libertarian.” If weak libertarians are included, there are many more of them. Regardless, I echo Kirby’s appreciation of growing scholarly attention to the political role of libertarians in the U.S. polity. A professional sports player has played for his hometown team for the past 10 years and has never played anywhere else. Recently, he was offered a lot of money to play for his hometown team’s rival in a different city. Losing their best player to a rival team would upset many people in his hometown. However, he decides to take the offer and play for the rival team. How morally offensive is this? How angry does this make you feel? You can give your reaction on a 1-7 scale. Second, the questions are overwhelmingly tilted toward eliciting an emotional, intuitive response rather than a reflective one. I don’t think of morality as a sliding scale of “offensiveness,” but Haidt does, and he forces his respondents into that philosophical straitjacket. My own response to almost all of these scenarios was “it depends.” There was no option for that, of course. So I chose an answer right in the middle of the scale. It turns out that middling answers on these scenarios puts you well below the typical liberal and conservative responses. Again, since libertarians often tend to elevate reason (possibly excessively) and denigrate emotion as a guide to moral judgment, they are less likely to take extreme positions on these questions. That tendency alone further biases the results toward libertarians’ appearing comparatively amoral. (*) “Essentially amoral” is my gloss on his findings. He criticizes libertarians as being extreme exemplars of so-called “WEIRD” (Western, Educated, Industrialized, Rich, Democratic) morality, caring only about rights and not about other moral dimensions. This post has been updated to add the footnote above.